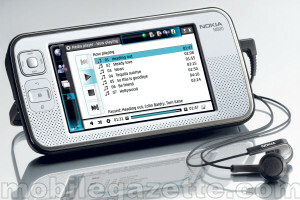 The Nokia N800 is the follow-up to the Nokia 770 Internet Tablet, building on the Maemo Linux platform developed by Nokia. The N800 uses the third incarnation of Maemo, called the Internet Tablet OS 2007 edition which adds a few new features to the 2006 edition (which in itself was a huge improvement over the original platform). It's roughly the same size as its predecessor - the Nokia N800 measures 75x144x13mm and weighs 206 grams. The 770 was 230 grams in its protective case, and 185 grams without it. The N800 shares the same excelled 800x480 pixel display of its predecessor.. this is a very high resolution display that puts the competition to shame. The N800 adds a webcam plus improvements to the tablet's WiFi and Bluetooth implementation. One key weakness of the old 770 was a lack of internal memory, and this has been increased in the N800. The N800 also accepts a wide variety of memory cards, including RS-MMS, miniSD, microSD and MMCmobile units, which gives a great deal of flexibility. One nice touch is that the N800 has an integrated stand, one of the first things that got lost on the older 770. 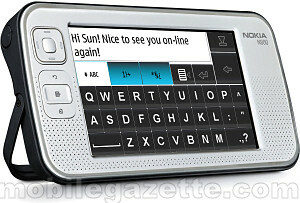 It's important to note that the Nokia N800 isn't a phone, although it will support Skype in the future. Connectivity is either through the N800's WLAN adapter, or via a Bluetooth phone. The 770 wasn't limited to Nokia phones either, so you should be able to use just about any Bluetooth handset with the N800, including 3G, EV-DO and HSDPA phones. The range of software available now and in the future for the Nokia N800 demostrates clearly that this is an ultra-compact computer. There's a version of the Opera web browser, an email client, RSS newsreader, multimedia player, games plus a range of utilities and other applications. It will also be possible to use the N800 with a GPS receiver as a satellite navigation system. The Nokia N800 has different looks too - the 770 was a bit "retro futuristic", the N800 is more polished and contemporary. Either way, both Nokia internet tablets have plenty of "wow" factor.. especially when people see the quality of the display. You could regard the Nokia N800 as "version 2.0" of the Nokia Internet Tablet. The original version of the 770 had plenty of rough edges (call it "version 1.0") which were largely fixed by the 2006 OS (call it "version 1.1"). Perhaps the N800 will be polished enough to make it a proper consumer product, whereas the old 770 was really for enthusiasts. The Nokia N800 is available now in the US and soon in certain European markets at around �400 / $400.